Even the best mattresses need the right kind of support. Box springs are great but moving them through hallways and up and down stairs can be next to impossible. If you were wondering if there’s a better way, you’re in luck. There is! A lot of different options are available these days and we’ve done the research to find the top box springs available. But first, let’s take a closer look at some of the features to keep in mind. Material - The top box springs available are one of two materials: wood or steel. Both are durable and will last a long time. If portability is something that’s very important to you, steel ones do give you a few more options. Size Range - The best box spring for sale should come in a range of sizes. Some are even available in sizes like Twin XL or California King! No matter what size mattress you have, there’s a box spring that will fit. Wood Slats - Wood slats are the parts that go across the top of the box spring that actually hold up the mattress. 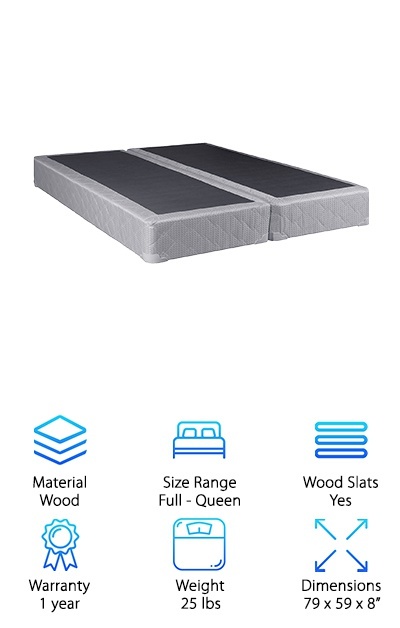 They’re not necessary, but they’re a nice thing to have to make sure your mattress is getting enough support. Warranty - All warranties have different terms and conditions so make sure you look at the one for your box spring very carefully. The top ones come with a wide range of warranties - some are actually guaranteed for a lifetime! Weight - Weight is important because your box spring has to be somewhat portable. That’s the whole reason we looked for an alternative to the standard box spring in the first place! Make sure it’s light enough to carry comfortably. Dimensions - The size of the box spring once assembled is important because it has to fit your mattress. You can have the lightest mattress around but if it doesn’t fit your mattress, it’s not really doing any good! Bottom line: for a good night’s sleep, you need the right box spring. If you’ve always had trouble finding one you could easily fit into your bedroom or if you’re just looking for something a little bit different, there are a lot of options out there. Now that you know what to look for, we’ll take a look at our box spring reviews. In a rush? Check out the top and budget picks first. Okay! On to the reviews! This one is simply genius. Is it the best box spring for memory foam mattresses? Maybe! It’s shipped completely assembled. So, what’s the big deal? It can be folded flat. This makes it easy to carry upstairs and through tight hallways. You can avoid that whole thing where you try a bunch of different angles to get the box spring through the bedroom door without gouging big holes in the walls. And get this. Installation is as easy as removing it from the box and unfolding it. Seriously. That’s it. 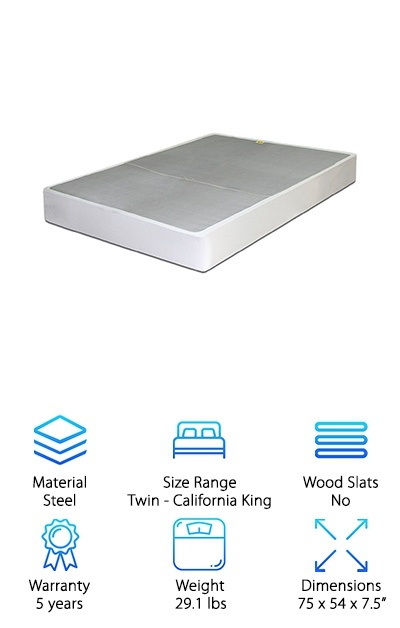 It’s constructed of heavy duty steel for maximum durability and will give your mattress a lot of support. It’s lightweight, doesn’t squeak, and will keep your mattress from sagging. It even comes with a protective white cotton zip cover. Zinus knows sleep. Well, they know beds and this Smart Box Spring proves it. 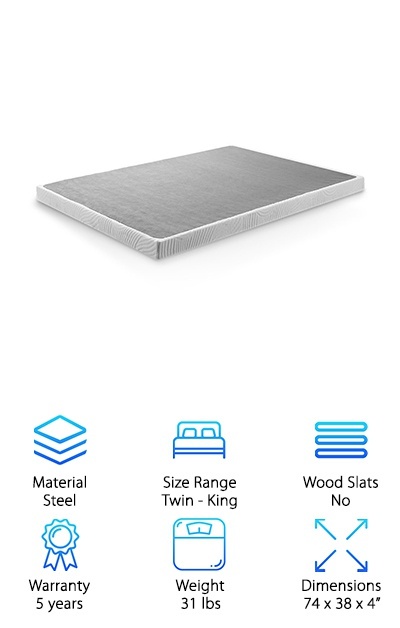 If you have a high profile mattress and setting it on top of a standard box spring makes it a little too high, this is a great choice. It has a low 4” height. But don’t worry. Just because it’s short doesn’t mean it isn’t sturdy. Everything on it is made of strong steel, including the slats. They’re less than 3 inches apart, which means great support and no sagging. Assembly is easy. Everything you need to put it together is included. It comes in a small box that’s easy to maneuver, whether you’re taking it up a narrow stairway or trying to get around a tight corner. It’s a smart and simple option. Just looking at this Night Therapy box spring would make you think that there was nothing special about it. But you’ve probably already guess by now that there is. It actually compresses and folds up. Whether you’re worried about storing it or if you’re just looking for something that’s convenient to move, you’ve found it. Imagine a king sized box spring that you can collapse and fold. How cool is that? The frame is made of heavy steel that provides solid support. There’s no assembly required, just take it out of the box and unfold. That’s not all. Want to make it even easier to move? It’s even available in split options for larger mattresses so you can move 2 small frames instead a large one. When the Best Price Box Spring arrives, you’ll look at the box and wonder how in the world a box spring could possible fit inside. It collapses flat and folds in half so it really does get quite compact. You can easily get it up stairs and down hallways to your bedroom without assistance and without scraping or banging into the walls. There’s no assembly required, just remove it from the box, unfold it, and it’s ready for your mattress. The solid steel provides great support. It’s covered in fabric that's’ grey on the top and a light cream color around the sides. It will blend into any decor. The engineering and design on this best box spring are truly remarkable. One last thing: It doesn’t squeak. Standard box springs are made of wood and maybe you like the wood. It’s sturdy, traditional, and lasts a long time. Well, you’re in luck. The Lifetime Box Spring is composed of 100% spruce. It’s better than a traditional box spring because it comes in an easy to ship, easy to transport package. Assembly isn’t difficult, but it does take a little bit of time. What do we mean? Some steel box springs practically assemble themselves. This Lifetime Box Spring requires a little bit of elbow grease but, once you get it together, all you have to do is throw the cover on and it’s ready for your mattress. 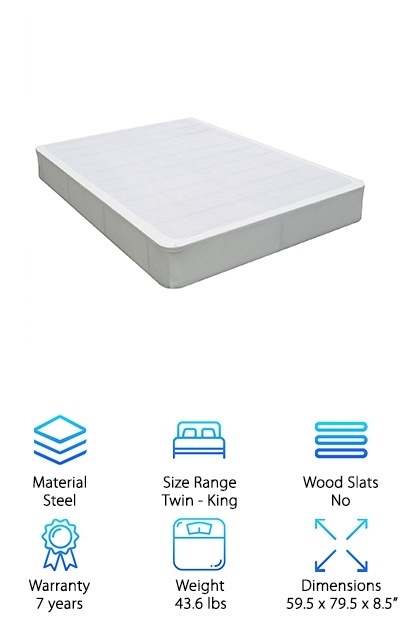 Speaking of mattresses, it works well with any variety: memory foam, latex, pocket coil, and even innerspring. Spinal Solutions is a factory direct manufacturer that puts together some great products. What does that mean? You’ll save a little bit of money. The manufacture everything right on site so they can oversee every aspect of production. That includes this Split Box Spring. It’s fully assembled by eliminates all the common problems associated with moving a box spring. How do they do it? It’s split in two. That’s right, instead of one large box spring, you get two smaller ones. This is something you can expect with a king sized mattress but it’s not always available in a queen sized like this one! The wood construction is solid and durable for reliable support. This is part of Luxury collection and is encased in foam for extra softness. This pine wood box spring from Zinus is a classic style from a modern brand. The 8” height is a great choice, especially if you have a high profile mattress. It will give the right amount of support without adding too much height. Lower profile box springs like this are also good for young kids or older adults who might have trouble getting into or out of a higher bed. This arrives in an easy to transport box with the box spring itself broken down into manageable pieces. Assembly is easy! The even include the tools and hardware you need. Here’s the deal: it’s easy to assemble but it’s equally as easy to disassemble. What does that mean? If you move, getting this bedspring to your new bedroom will be a cinch. 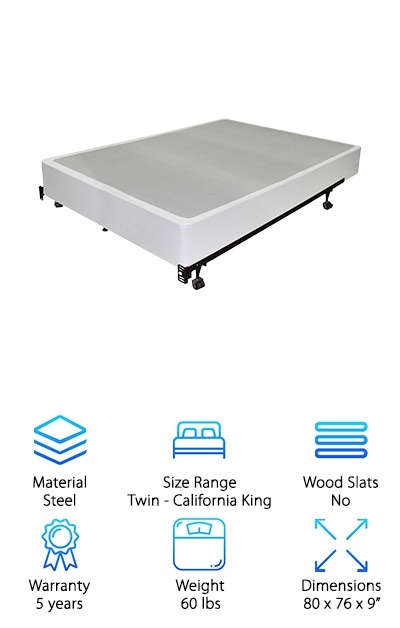 For a solid, supportive, steel box spring, you can’t do much better than this one from Swascana. Assembly is really easy, all you need is an Allen key and a small wrench which are both included. And check this out. It’s squeak free. It comes with a fabric cover to add protection from dust mites or any other little pests. Plus, the cover is washable so you’ll be able to keep it looking new. Because it’s made out of steel, you don’t need to worry about how much weight it can hold. 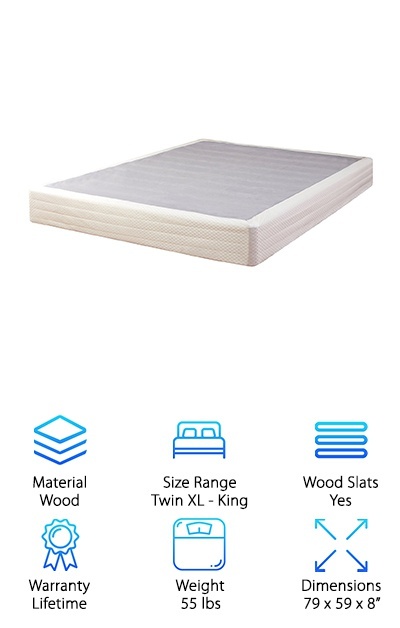 This one works well for any mattress and any sleeper. 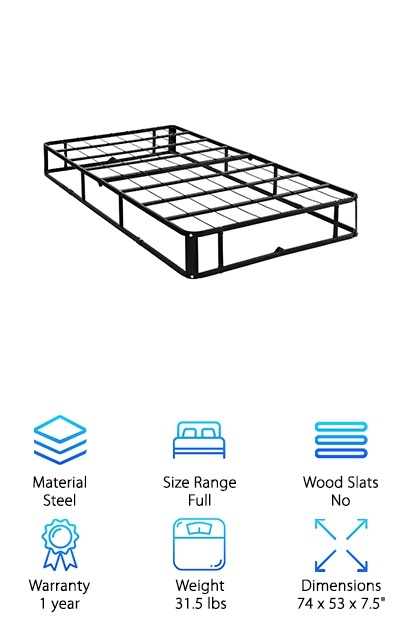 The steel support bars are about 6” apart and it’s the perfect size to fit down inside a bed frame. Even though this box spring from Mainstay is made from durable, heavy-gauge steel, it’s still easy to transport and store. Why? Because you can easily fold it in half. It comes pre-assembled, all you have to do it unfold it and it’s ready to go. It’s naturally resistant to bed bugs and even comes with a coverlet to protect your mattress. How does it work? The fabric that sits on the top of this box spring is non-slip. 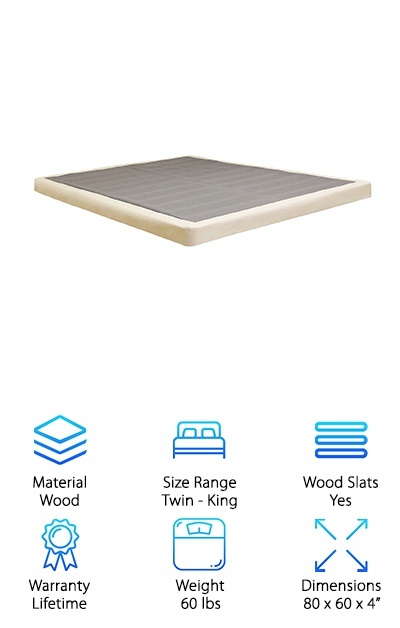 This stops your mattress from moving around or sliding! For college students who change apartments or dorms every year, this box spring will make moving a breeze. Get this - it’s light enough that one person can usually move it without help! Despite that, this full sized one can hold up to 1200 lbs. Do you have a high profile mattress and a standard box spring and feel like you need a step stool to climb up onto your bed? Well, this Lifetime Low Profile Box Spring could be the answer. 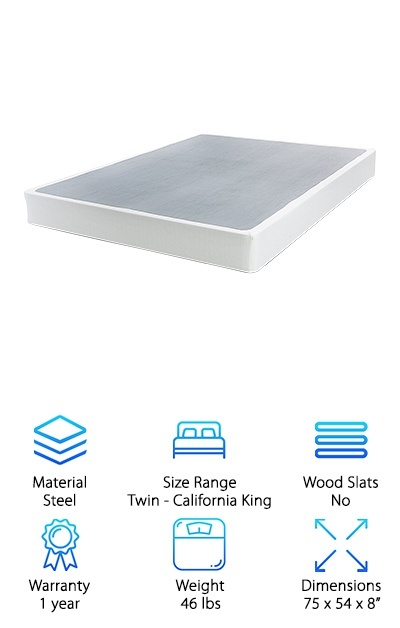 The low 4” profile makes this a perfect match for thick mattresses. It’s ideal for houses with narrow halls and stairways where a standard box spring is next to impossible to maneuver. It comes in an easy to manage box. Don’t worry! Assembly is easy and should only take about 15 minutes. Then, pull on the included cover, zip it up, and it’s ready. 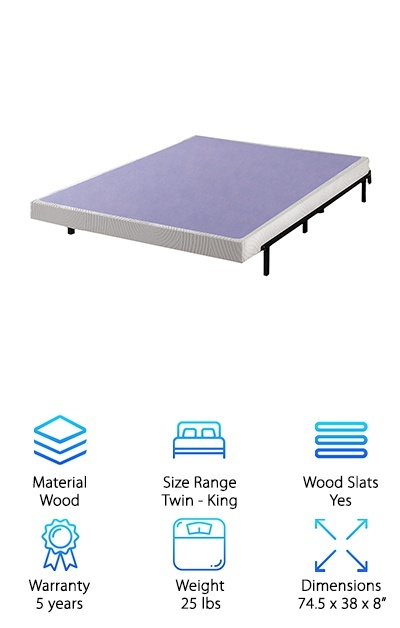 Because it’s one solid piece when it’s put together, it provides even support for your mattress. What kind of mattress? Any type from foam to latex to innerspring.